Musicians like BB King and Eric Clapton make the guitar seem so simple. Unfortunately , many aspiring guitarists soon discover that it isn't as easy as it seems. gTar to the rescue. 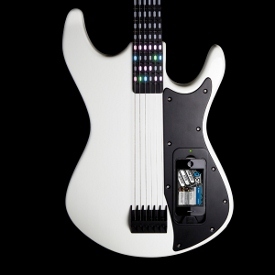 This digital instrument allows anybody to play music quickly and easily with the help of LEDs and an iPhone. All you have to do is dock the handset in the body, load up the gTar app, and an array of interactive LEDs along the fretboard will show you how to play. And that's not all. The instrument comes with an intuitive feature called SmartPlay that mutes incorrect notes to encourage you to play through difficult songs. This digital axe hasn't started shipping yet, but you can pre-order it for $399 (Rs 23,500) - small price to pay for rock star fame.